Flavorful, well-marbled short ribs seem like the perfect candidate for grilling, but getting the texture just right can be a challenge. We wanted meltingly tender meat with the nicely browned exterior that the grill provides_without having to constantly fiddle with the fire. We started with a flavorful spice rub and a sweet-tart glaze. Ground fennel and cumin added more complex layers to the rub. For the glaze, we came up with several options using tangy, bright flavors to help temper the richness of the meat. Short ribs are full of collagen, which converts to gelatin during cooking and produces a tender texture. 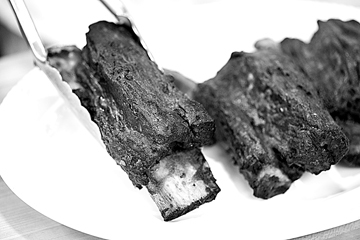 We went with bone-in ribs to make sure they wouldn’t overcook before the collagen had enough time to break down. Even a carefully monitored grill inevitably produces hot and cold spots, and the spotty heat was causing our short ribs to cook unevenly. Starting the ribs in the more even-heat environment of the oven was the optimal solution. When the ribs reached 165 F, we moved them to the grill to finish cooking and get a smoky, crunchy crust. Meaty English-style short ribs are preferred in this recipe to thinner-cut flanken-style ribs. Make sure to choose ribs that are 4 to 6 inches in length and have at least 1 inch of meat on top of the bone. For the spice rub Combine all ingredients in bowl. Measure out 1 teaspoon rub and set aside for glaze. For the short ribs Adjust oven rack to middle position and heat oven to 300 F. Pat ribs dry. Sprinkle ribs with spice rub, pressing into all sides of ribs. Arrange ribs bone side down in 13 by 9-inch baking dish, placing thicker ribs around perimeter of baking dish and thinner ribs in center. Sprinkle vinegar evenly over ribs. Cover baking dish tightly with aluminum foil. Cook until thickest ribs register 165 F to 170 F, 1 1/2 to 2 hours. — For a charcoal grill: Open bottom vent halfway. Arrange 2 quarts unlit charcoal briquettes into steeply banked pile against side of grill. Light large chimney starter half filled with charcoal briquettes (3 quarts). When top coals are partially covered with ash, pour on top of unlit charcoal to cover one-third of grill with coals steeply banked against side of grill. Set cooking grate in place, cover, and open lid vent halfway. Heat grill until hot, about 5 minutes. Clean and oil cooking grate. Place short ribs, bone side down, on cooler side of grill about 2 inches from flames. Brush with 1/4 cup glaze. Cover and cook until ribs register 195 F, 1 3/4 to 2 1/4 hours, rotating and brushing ribs with 1/4 cup glaze every 30 minutes. Transfer ribs to large platter, tent with foil, and let rest for 5 to 10 minutes before serving. Nutrition information per serving: 518 calories; 261 calories from fat; 29 g fat (12 g saturated; 0 g trans fats); 167 mg cholesterol; 727 mg sodium; 6 g carbohydrate; 0 g fiber; 5 g sugar; 54 g protein.